If you’re like me, when you find a pillow that works for you, you stick with it! Over the years I’ve tried quite a few brands and styles and while I’ve been happy with some of them, I really have never found the “perfect” pillow. 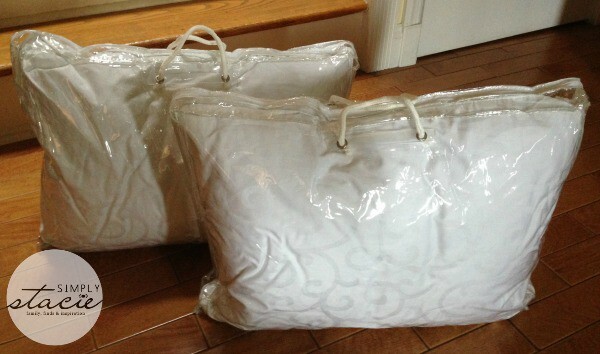 But I’m pretty sure my search is over, now that I’ve had the chance to sleep on a pillow from DownLinens.com. 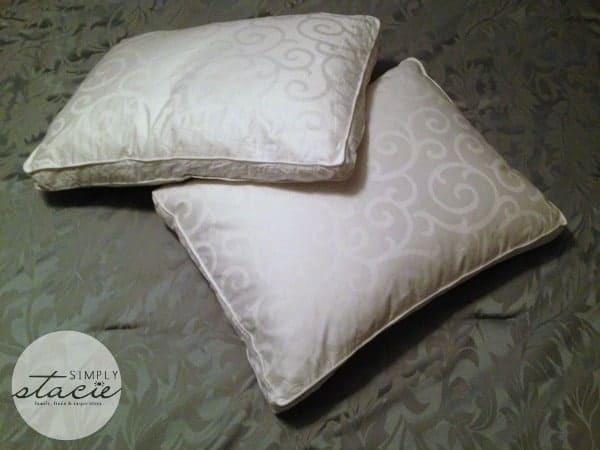 I received two Cloud 9 pillows from DownLinens.com for review. When I first took them out of their packaging I was impressed with how soft yet firm they felt – usually I find pillows to be one or the other, so I was quite intrigued. They fit in my standard pillow cases, so there was no need for any special sized coverings. I went to bed that night excited to give these pillows a try and I have to say, I had one of the BEST nights sleep I’ve had in a long time. Usually I use two pillows and find myself constantly adjusting them during the night, but with the Cloud 9 I didn’t need a second pillow. The firmness of the Cloud 9 kept it at the perfect height all night. There was no sagging. It was so comfortable. Being a side sleeper, this pillow really kept my shoulders from sinking in too far in the bed, which has always been an issue for me. My husband, who tends to sleep on his back a lot, also felt a nice difference using this new pillow. He also found it to be very comfortable. The concept behind the creation of the Cloud 9 was to fuse both the support of feathers and and the comfort and luxury of Down. DownLinens has really succeeded in creating a pillow perfect for those of us who enjoy a soft pillow that can still provide the support necessary to keep you comfortable all night long. The Hypo Allergenic Cloud 9 is a 70/30 Feather Down Pillow that comes with an elegantly designed jacquard pattern easily removable zipper cover. The Cloud 9 sells for $44.99 on the DownLinens site and comes with a 30 day money back guarantee. DownLinens is a family owned business that has been a leader in the down and feather industry for over 25 years. They are committed to providing their customers with the best sleep solutions, and are equally committed to providing outstanding customer service. You can see their full line of products on their website. I love an all season down comforter! Love the pillows and the Deluxe Down Alternative Comforter is really nice, also. Thanks! I also love the Deluxe Down Comforter. This with the pillows would be heaven on earth! 1000 TC Luxe Mattress Pad. I’d love the Down Free Fiber Bed.